Contents The Purpose Of This Welcome Guide .............................................................................................. 2 Year 3 Welcome Message from the Head of the Medical School ................................................... 3 What happens in Year 3? ................................................................................................................. 6 Learning The Lingo ........................................................................................................................... 7 Quotes from your Peer Mentors...................................................................................................... 9 Preston Societies! .......................................................................................................................... 11 Other Useful Information about Preston ....................................................................................... 12 Preston – A Welcome From Your Dean ......................................................................................... 13 1. Royal Preston Hospital ................................................................................................................... 15 Chorley and South Ribble Hospital ................................................................................................ 17 Here at P-R-E-S-T-O-N! ................................................................................................................... 19 2. Top Tips For a Stress Free Portfolio ............................................................................................... 21 What Is A Logbook? ....................................................................................................................... 22 What Are Themed Case Discussions (TCD)? .................................................................................. 24 Secondary Component Teaching (SCT) .......................................................................................... 26 What is Clinical Debrief (CD)? ........................................................................................................ 27 What Are Prescribing Tasks? .......................................................................................................... 28 Clinical Skills ‘A Practical Tool Kit’ .................................................................................................. 29 Top Tips For OSCE’s ........................................................................................................................ 31 Progress Test In Years 3-5 .............................................................................................................. 33 What Are Applied Personal Excellent Paths (APEP)? ..................................................................... 36 What Are Student Selected Clinical Placements (SSCP)? .............................................................. 38 Conferences, Presentations And Publications ............................................................................... 40 3. That Transition into Clinical Education Years ................................................................................ 42 Things I Wish I Knew Pre-Hospital ................................................................................................. 44 Motivation where does it come from? .......................................................................................... 46 Making the Most of Medical School .............................................................................................. 48 Guidance For Direct Entry St. Andrews Students .......................................................................... 50 Guidance For Direct Entry Dental Students ................................................................................... 52 Guidance For Direct Entry IMU Students ....................................................................................... 54 4. How is it different to previous years? Year 3 is a much more hands on style of learning, with a lot of time spent in the hospital. Each week, you will be expected to attend a ward round and clinic. You will have a number of “signoffs” to complete, by talking to patients and examining them. You will also be taught skills such as taking swabs, observations and scrubbing up. You will go round the blocks in a group of six to eight students. Generally there are two St. Andrews students in a group together. The groups are allocated randomly, you typically go round with someone in your group. Other Useful Information about Preston Fitness Preston has a long sporting tradition and there is ample opportunity to join local clubs whatever your sport. Examples include Preston Grasshoppers Rugby club (men’s and women’s teams), Preston Hockey Club, multiple cricket clubs, Fulwood Lawn Tennis Club and even Preston Roller Girls if roller derby is your passion! Preston MedSoc has a number of sports clubs including badminton, netball, football, climbing, tennis and squash. There are a number of gyms in the area including Fulwood Leisure centre, GymWorks and PureGym. The local Park Run takes place in the Victorian-era Avenham Park in the centre of town every Saturday. The park is also a lovely place to go for a walk or run for free. Leisure Preston itself has two cinemas, a go-karting track, bowling, trampolining and our very own Escape Room. It also houses some of the best pubs in Lancashire with a burgeoning real ale scene- The Plungington Hotel and The Black Horse are musts! The local pub to the hospital is The Black Bull. It’s about a 5 min walk from the hospital and plays host to a few Preston MedSoc events. In case you really need to impress your Manchester friends or family (especially if someone else will be picking up the bill!) then you’ll find some superb food at Bistro Pierre and Haighton Manor. Shopping Preston’s high street as well as Fishergate and St George’s Shopping Centres provide a variety of shops and restaurants for the centre of town. There is also a large retail park at Deepdale on the east side of the city. There are plenty of supermarkets including Asda, Sainsbury’s, Booths and Aldi. Preston â&#x20AC;&#x201C; A Welcome From Your Dean A very warm welcome to you from all the Undergraduate staff, clinical teachers and myself at Lancashire Teaching Hospitals NHS Foundation Trust. Firstly, congratulations, you’ve hit the jackpot! 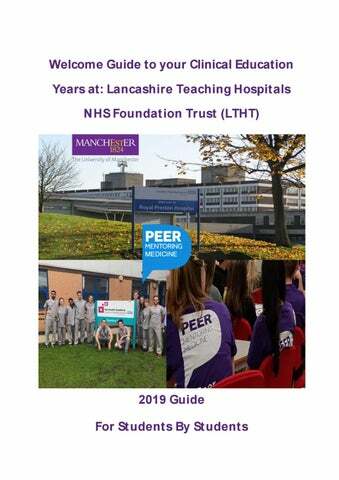 Also known as LTHTR (Lancashire Teaching Hospitals NHS Foundation Trust – the acronym makes no sense and nobody is entirely sure where the ‘R’ comes from – rumour has it if you manage to solve it single-handedly you are immediately given a consultancy in whichever field you fancy, regardless of prior training). Staff members will have email addresses such as ‘firstname.surname@lthtr.nhs.uk’ which is a good thing to remember for the eforms that you will be need to get signed off. People to Know About These people will help you through year 3 and actually tend to make it a whole lot better for you if you can get to know them early. Professor A. Woywodt – Associate Dean Year 3 Lead. A great guy! Claire Weston – The most organised person ever, you’ll be getting 10-15 emails a week from Claire and she’ll help you every step of the way if you forget you actually have to do things to get them signed off etc. – who would forget that? SWAPS – Make yourself known to them, they really are top notch. Claire Vassallo– There isn’t a bigger smile in all of Preston, and Claire in particular can be a lifesaver during all of those comms sessions. The Clinical Skills Team – Aidan, Jacqui, Sam and Megan. They are all frankly the nicest people around, and if you can make the effort, these guys will make sure you’re looked after for OSCEs and find you all sorts of on-going research and extra-curricular stuff to build out the ever-important portfolio. Clinical Placement Facilitators – for year 3 Yvonne Thompson is the lead and the person to contact. They are excellent in supporting/mentoring students within the placement. They would be the first contact person for the students if they have any issues on placement or if they want some direction for learning opportunities, getting UPSAs and skills practiced and signed off as well as history taking. DGHs – District General Hospitals DGHs aren’t as big a thing in Preston, as elsewhere have many we only have the one. You will undoubtedly get a placement in the pretty little market town of Chorley at some point in Year 3, but it’s only a 20 minutes’ drive and there is a free shuttle bus for staff anyway, so it’s no big deal. It’s actually a lovely little hospital. in Year 4 there are GP placements across Lancashire that may require driving capability. Where to Live Anywhere close by really. Preston isn’t anywhere near as big as Manchester and you could realistically live in any part of town and still get to the hospital in 20 minutes in the car. Most people live in the Fulwood area around the hospital, which is one of the nicer parts of Preston and is benefitted by certain free bus routes with your NHS card. Otherwise, there’s the internationally renowned Plunginton Road, which is like Preston’s studentified Fallowfield-esque neighbourhood, although that’s kinda UCLan’s patch so you’ll have to be prepared to socialise. Anywhere along the Garstang Road is good and I live in the Centre of town and, even then, it’s an ‘easy’ 15 minutes bike ride up the hill to the hospital. The map below shows where the 19 bus runs from town to the hospital. To get from the town centre to the hospital by bus take the 19, 19A or 23. You need to have the exact change to pay for bus fares. Chorley offers many fantastic learning opportunities As part of your time in Preston, youâ&#x20AC;&#x2122;ll be spending some of your placements in Chorley Hospital. Since you may not know much about this before you arrive, hopefully this section clears up any concerns you might have! Being a DGH there will be very few students on the wards, allowing a lot of one-to-one teaching to be carried out. Many of the doctors on the wards spend plenty of time explaining things to you on their ward rounds or clinics which certainly helps in consolidating the pre-clinical knowledge youâ&#x20AC;&#x2122;ve acquired and applying it in the clinical situation. There are also ample opportunities to practice your clinical skills whilst in Chorley, such as taking bloods, inserting cannulas and many others. Further to this, many of the Doctors in Chorley are more than happy to listen to you present patients to them, and even clerk some of the new arrivals in. The same goes for watching you perform examinations, which enables you to fine tune your technique and structure. Both of these are crucial skills to develop and youâ&#x20AC;&#x2122;ll find an abundance of opportunities to practice them at the DGH. To conclude, Chorley will inevitably be part of your clinical experience whilst in Preston so my advice would be to ensure you capitalise on all the opportunities presented to you so you make the most of your time here. Where can you get accommodation? Most students will live in Preston and make the commute to Chorley so accommodation shouldn’t be a concern in that respect. Where can I buy lunch? The education centre in Chorley hospital has a canteen where you can purchase food and/or eat your packed lunch. Remember to bring your NHS badge as there is a discount available! Additionally, if you’ve just come off the shuttle bus you can make your way to the Royal Voluntary Service shop situated at the main entrance where you’ll be greeted by lovely staff who offer a generous variety of snacks and drinks at very reasonable prices. Is there WiFi? The public wifi that you use in Preston is the same one that Chorley uses. Is there a Library? In the Education Centre there is a library which is open 24/7. Can You Use The Skills Lab? There is a skills room at the Education Centre in Chorley but the main one is in the Education Centre 2 at Royal Preston Hospital. When You Have a Problem You Can Contact If there is a sudden change to your teaching session, the fastest way to solve it is to ask around for another learning opportunity, as all the staff on the wards are keen to help and arrange an alternative for you. You can also contact your Clinical Placement Facilitator who organises your block timetable – they are always very helpful and readily contactable by email, phone or text message. Additionally, the hospital staff at Reception (just after the main entrance) are very friendly and will point you in the right direction if you are not sure where to go in the hospital. I know how you some of you might be feeling. I’ve been there too. You feel nervous about starting your clinical education years somewhere far away from friends and what you know. Well I’m here as living proof you’ll learn to love it. 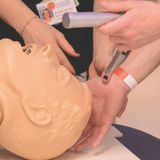 Further down the line you’ll remember some of the things in this guide and they will help you as you progress through your clinical education years. 3. Little and often is easier than saving everything to the last minute Students who make regular, small updates to portfolio often report spending much less time on portfolio than students who carry out inefficient last-minute sessions. Not only that, but these last minute writing sessions often take up entire weekends of personal time. There are numerous, small quiet moments on wards or between clinics. A little time spent jotting down a quick reflective piece during these times prevents portfolio eating into your weekend. 4. Set your own reminders There a very few reminders about portfolio throughout the year. You need to be proactive in reminding yourself to complete the work. An efficient way to do this is to schedule yourself a onehour session on the medlea calendar at the end of each placement. Year 5 In final year, the progress test becomes a pass/fail, summative assessment. The pass mark is not determined based on cohort scores, but about how you compare to the minimum required standard, this is called the Angoff method. This is a fair approach as in theory every student could achieve the standard required to pass finals. If you are interested in knowing how the pass mark is determined and you can find information in the Programme Handbook. But more importantly, remember that the vast majority (90 – 95% usually) of students pass exempting exams, and if you don’t there is a second chance in finals. There is lots of support for students preparing for Finals organised by each clinical education campus, and again the majority of students pass at this point! About Where To Live? This is mainly a personal preference and depending on where your clinical education campus is. You might want to live close to your clinical education campus, which might be far from the City Centre, or live in the City Centre and commute to the hospital every day. You will be sent to one of the main four clinical education campuses, (MFT) Wythenshawe, Salford, (MFT) Oxford Road and Preston. If you are in Preston, it’s going to be a whole new game living there as it takes 1 hour plus to commute by train, so basically you are there most of the time. For the others, staying in the City Centre is LOVELY. Most of us seniors chose the latter because the transportation system is much more accessible in the City Centre, as sometimes you might be sent to other hospitals or clinics for certain placements. It is also important for us to highlight that average rental in the City Centre is around 500 pounds excluding bills but the rooms are a lot nicer than what you can get in the main cities such as London or even Edinburgh. If the above is too troublesome for you or it’s your first time, book university accommodation to avoid hassle (and it's guaranteed warm). Union page on Facebook to keep yourself updated! You won’t regret it. Besides that, if you are interested in working part time or do any other sort of extra curriculum activities, do not hesitate to contact us seniors! We are always happy to help. What To Do If You Feel Faint In Theatre (Previous Medicine Students said): • It is INCREDIBLY common so don’t be embarrassed to speak up!! If you leave it too late, this could put the patient at risk so SPEAK UP ASAP. • Sit down. It’s better to sit down than pass out and hurt yourself/someone else/ the patient. Lie down if you feel woozy sitting up. • Leave theatre. • Get a drink of water and something sweet to eat once you’ve come around. 1MedBuzz …is a great resource for enhancing your time on this programme. It is the 1Med hub for extra-curricular activities, careers resources, peer mentoring info, society info, opportunities, and so much more! Buzz is an excellent tool for keeping up to date with what’s going on and the vast amount of opportunity available to you! What is Wellbeing? Being a medical student can be challenging at times and can feel overwhelming, especially as you start your clinical placements. We care greatly about your health and wellness and we want to make sure each and every one of you feels supported and able to blossom while you are with us.